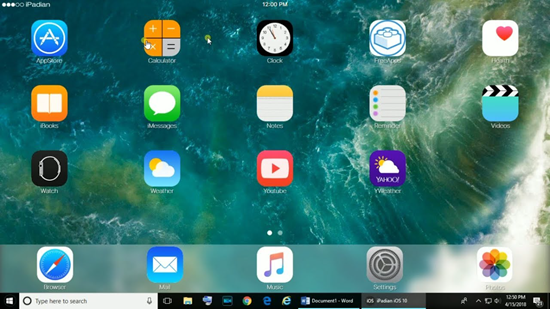 If you don’t have an iPhone availble but would like to work with some iOS apps, then there are still chances for you: you can make use of the iOS emulator for Windows to run iOS apps on your PC. If you install an iOS emulator for Windows, you will be able to work with the iOS apps as if you are using the iPhone. Certainly you may wonder which iOS emulator app is the best? You need not look elsewhere. In this article, we have listed 6 best iOS emulator for Windows PC to run iOS apps. An iOS emulator is basically a software that enables host to function as another operating system iOS. It enables a Windows-based computer to emulate or imitate an iOS-based smartphone or tablet. The iOS emulators will be useful if you need to test the apps before submitting the required files to the Apple App Store; moreover, users will be able to work with iOS apps and games without purchasing the costly iPhone or iPad. There are plenty of iOS emulators on the web developed by several companies for you to find out. However, picking a right choice is difficult since you don’t know which software is good and safe, for some of them may be malwares or virus. There are several software programs that allow you to use with Windows 7, 8 and 10 as we list in the following. 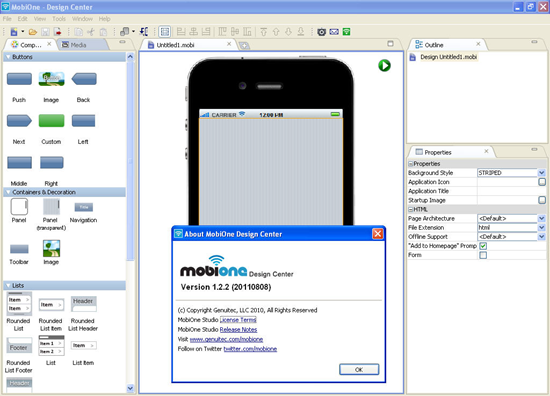 MobiOne Studio helps you emulate iOS environment on Windows PC to run various iOS apps easily including the ability to develop iOS apps. The software has been downloaded by more than half a million developers since its launch 8 years ago. The app includes unique features such as personalized user interface templates, which you can make use of the drag and drop function for not only portrait but also the landscape orientations. MobiOne also provides support for reviewing and testing large-sized apps with the help of App Sync technology. However, The MobiOne Studio has been discontinued. If you still want to install the app, you can downloading the relevant EXE file via trusted third-party sites. Yet you should be careful because the EXE files could be prone to viruses and malwares. Smartface enables you to develop and provides basic functions with unlimited apps free of charge on Windows operating system. You can work with the Smartface tool easily. You just need to install the software on the host device via the App Store and establish connectivity with the Windows PC. Of course, you also need an iTunes installed on your computer. Then You will be able to develop native apps via Smartface after the iOS is emulated onto the Windows device. The program also includes a module to debug your apps with several features such as breakpoints and real time code changes. It is possible to test the applications in wide range of iOS environments. The interesting point to note is that the software can also be used with the Android platform with equal efficiency. Air iPhone Emulator is used to create realistic iOS emulation effects and is considered as a premium program. The Air iPhone Emulator makes effective use of the Adobe Air Framework to create the GUI of the selected iOS on the Windows computers. 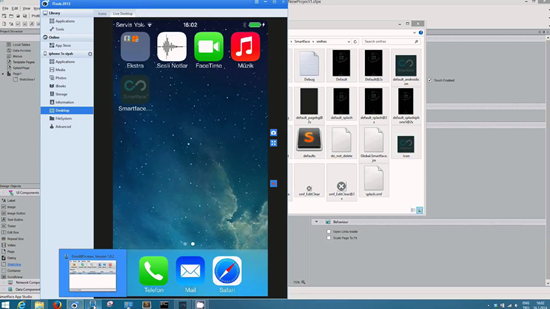 As a developer, you can upload newly developed apps to the Air iPhone emulator. Hence, you can test the functions before uploading the final code files. Even though the emulator ships with several features, apps installed by default on iPhone/iPad such as Safari browser are not available. The app was initially developed to enable users to make and receive free calls through Ribbit, which was later acquired by BT in 2008. The iPhone Simulator is a premium tool when it comes to simplicity and the number of features speaking of this kind. The UI is designed in a brilliant way to enable you to work with iOS apps with minimum effort. The iPhone Simulator doesn’t provide access to apps such as App Store and Safari browser. However, you can work with clock, Notepad, Calculator and much more. The iPhone Simulator is a flash application with limitations. The program will be useful for those developers who would like to experience the iOS environment during the initial stages of their programming projects. It is to be noted that the tool doesn’t offer advanced capabilities such as debugging. The iPadian is designed for PCs that are running Windows XP and above. The tool helps you to launch an alternative desktop that looks like an iPad display. The iPadian is not a true emulator but an iOS simulator. The tool is used as a desktop application based on the Adobe Air platform. The program comes with its own App Store, which includes several apps that can run on Windows. And hence you will experience the feel of using the iOS apps even though you are using the Windows platform. The problem of iPadian is that it is not capable of emulating the whole iPad such as the Touch function. You won’t experience the same touch interaction when you work with the tool on Windows. The swipe function associated with the iPad won’t work properly. Free version of iPadian provide basic iOS feel for free. Access to customised App Store in free version. You can work with any app free of cost with Apple App Store in Premium version. Premium version is totally ad free and cheap at $10. Download iPadian on computer and run the installation file. You should follow the on screen options and Click on Next accordingly. Once, you have successfully installed iPadian in your PC, you can follow further steps to run iOS apps in your Windows Computer. Once completing installation, open iPadian from the desktop. To use iOS apps, go to Store on the iPadian interface, and download the apps you want from there. Once installed, you can use iOS apps on Windows PC hence. Appetize.Io is a cloud-based iOS emulator and hence you will not be able to download and install the software directly on your PC or laptop. The developers have termed the tool as an excellent iOS emulator for Windows. If you are on a lookout for an alternative tool similar to the abandoned App.io, this could be a good choice. The software is available free for the first 100 minutes per month, and you will have to pay $0.05 per minute after you exhaust the limit. Yet it is not possible to install any app in the emulator, since the demo is purely based on the test .IPA files. To work with Appetize.Io, you need to upload .IPA file in the upload form and provide your email address. The relevant link will be later delivered to your mail box. Then you just need to click on the link to test the relevant .IPA file in the Appetize.io online Emulator. Even though you don’t have any iOS device like iPhone, iPad or iPod Touch, you can make use of the iOS emulators described above to work with the iOS apps. You need not change the computer since you will be able to install the emulators on your Windows laptop or computer. 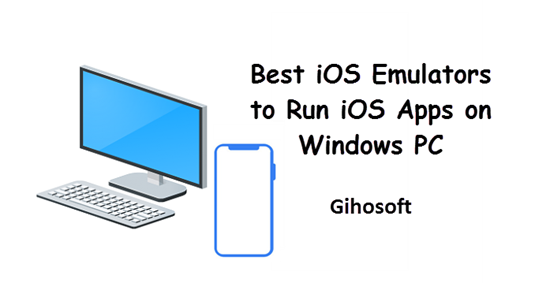 With the help of emulators, you can easily access a virtual Apple device from within the Windows systems easily without any extra cost. The iOS emulators provide an ability for the app developers to develop, build and test their apps in the real-world iOS environment. Moreover, they will be able to fine-tune the app with new features before the official release, and this will help the developers to grow faster since they are offering error-free app after testing.